The Beatles kicked off November 1963 with their Royal Variety performance in the presence of the Queen Mother and Princess Margaret. This night John Lennon was to announced to the crowd “For those of you in the cheap seats clap your hands to this one: the rest of you can rattle your jewelry” and then launched into ‘ Twist & Shout ‘ and Beatlemania had arrived in Britain! The Beatles went off on a tour of England and was met by large crowds of female girls screaming and fainting at the very glimpse of the mop tops and most of these shows on this tour were held in cinemas as the boys criss crossed the country for the month getting 300 pounds a night and not being able to hear a thing they were playing! The single ‘ She Loves You ‘ had been No 1 in the UK charts and would be followed by ‘ I Wanna Hold Your Hand ‘ in late November ’63 selling a million copies before release. On November 22nd the Beatles second album ‘ With the Beatles ‘ was released with its distinctive black and white half shadow cover and haircuts and I remember the girl who lived across the road Linda coming over to my house with the record and hearing it for the first time. It sounds so fresh and tight, full of atmosphere and the band deliver a masterpiece with Ringo supplying the back beat for the boys to supply their chunky rhythm and sing their hearts out!. No songs were released as singles in England off this LP but all of the songs are well crafted and are super good ! 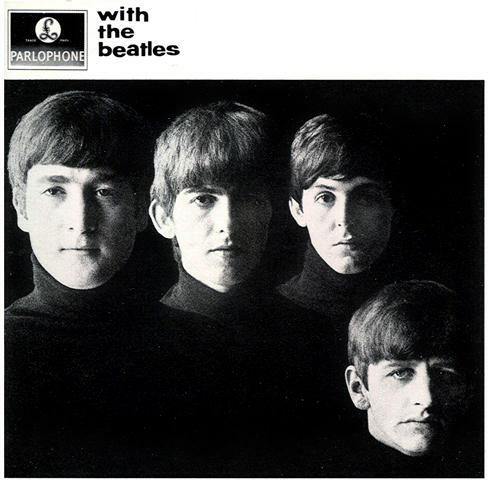 ‘ With the Beatles ‘ was the follow~up to the ‘ Please Please Me ‘ LP which was recorded in one day and this LP had more time spent on it and is well recorded by George Martin and the Beatles sparkle and rock with great playing and harmonies from beginning to end with a few covers, lots of original Lennon and McCartney songs and the first George Harrison composition. ‘ It Won’t Be Long ‘ starts things off with John on lead vocal and plenty of harmonies then slows with ‘ All I’ve Got To Do ‘ followed by Paul singing ‘ All My Loving ‘ brilliantly. Next up is George with his own song singing ‘ Don’t Bother Me’ . 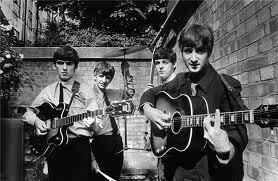 Then we have the rocker ‘ Little Child ‘ with Paul on piano and Lennon with a great vocal performance. Paul takes the lead on the sweet ballad ‘ Till There Was You ‘ . ‘Please Mr Postman ‘ ends the side with John delivering again a great vocal performance on this Motown classic by the Marvelettes. George takes the mike on Side Two with a steamrolling version of Chuck Berry’s ‘ Roll Over Beethoven ‘ and ‘ Hold Me Tight ‘ rocks along with Paul’s vocal and the boys full of energy. Smokey Robinson’s ‘ You Really Got A Hold On Me ‘ is my personal fave and features George Martin on piano. Next along is ‘ I Wanna Be Your Man ‘ with Ringo taking vocals and this song would give the Rolling Stones their first big hit in the UK! Next is a great song ‘ Devil In Her Heart ‘ which is a Beatle cover of a group called The Donays which would have probably been forgotten if not recorded by the Beatles. the last Lennon and McCartney song on the album is ‘ Not A Second Time’ with John on vocal and to finish the album another Motown hit ‘ Money ‘ which gave John a chance to show us his raw vocal power one more time. The world would soon change as the Beatles went on to conquer the globe and like the two world wars the Yanks were late to the party! Will we ever see the likes again!